Over the last several years, many of our most pressing national challenges have been caused or aggravated by a failure of wisdom or character in leaders in finance, business, government, and education. The stock market collapse, mortgage industry implosion, burgeoning national debt, failing schools, increasingly fractured families, and indeed, this last demoralizing election season, all have roots in a failure of citizenship, character, and community. Exacerbating this trend is the fact that there are so few spaces and resources available for reflection and conversation on “first principles” – what makes for a healthy family, business, organization, or society. For leaders to embody and transmit the values and principles that make for a flourishing culture, they must first develop and internalize those values themselves. 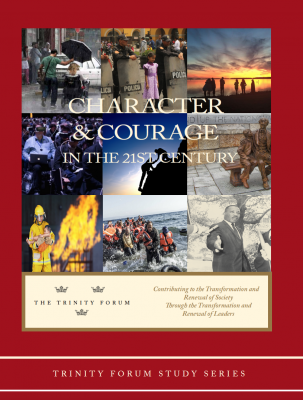 This curriculum will help the reader understand and reflect on the challenges our country faces, the content of one’s character that is required for leadership, and the unique nature of courage and virtue needed to sustain freedom, democratic order, and human flourishing.